I looked out my window and what did I see? Brown barren ground and cold empty trees. Winter has brought me such a big surprise! No snow in the forecast or before my eyes. I think there is an Ebeneezer hiding away in all of us. He likes to come out when we aren't looking. He likes to spread his sour attitudes around to poison the holiday mood for all of us. Or maybe it is just me. 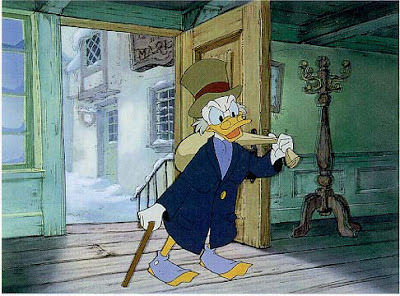 This may be a little premature, but I think my Scrooge got out. Again, it may be premature, but the Christmas Spirit just doesn't posses me yet. Maybe it is because there is no snow on the ground and it is December. Maybe it is because I don't have my decorations up yet. Maybe it is because I am learning how to be a good mom to two wonderful kids (have I bragged about them lately? They are the BEST!). And that is the reason I want to have the Christmas spirit in my home. For my children. I want them to have wonderful memories from the start. I want them to be able to savor the magic that is in all holidays and to remember with warmth and tenderness the celebrations from the very beginning. So I am very annoyed that old Ebeneezer decided to visit this year. Of course any time he visits annoys me, but that is beside the point. The point is, I have to find a way to get rid of this oh so horrible Mr. Grinch. The Christmas Spirit stealer... the sucker of all joy... the orphan kicker... the sultan of swat... the king of Crash... the colossus of clout! Oh wait, that is Babe Ruth. Sorry. But you get the idea. So, in a frantic frenzy I am going to be doing some inviting of the Christmas Spirit into my home. I am temporarily changing my background, because I need something more conducive to the Christmas Cheer. Did you notice my subtle snow storm? I am hoping the Snow Queen will take the hint. Anything to expel the apathy that is enshrouding us. There will be baking, snow flake making, candle burning, decorating, music playing and lots of other things ending in ...ing. Off you go Mr. Grinch, Mr. Ebeneezer Scrooge, Mr. Ruth. Do your damage somewhere else. And bring some snow as you leave, darn it! What about you? What do you do to rid yourself of the anti christmas feelings? Delilah and her Christmas music just aren't helping me a whole lot. Every once in a while, I have a year like this, where the Christmas spirit is just not coming for me. The only thing that helps me is when I get out and serve someone else. Go do an angel tree, or volunteer somewhere (hard with a new baby), or make a donation to a place that specializes in bringing Christmas cheer to the less fortunate....that's what helps me every time Mr. Scrooge is hanging around. I think your new Christmas banner should go a long way towards banishing the Scrooge in you. What I did yesterday was hit iTunes and make myself a brand new Christmas CD. By the time I was done, it was more than beginning to feel a lot like Christmas! But...the best remedy of all is the one you've already hit upon. Do Christmasy things with your kids! It works. We set up our Christmas stuff while listening to Christmas music.. I was surprised how much it really worked. We set up all of our Christmas things while listening to Christmas music, I was surprised how well that really worked. I haven't had the same problem with Christmas this year, just with the past two holidays. They were getting in the way of Christmas for me. Now I can officially start to enjoy the Christmas season without any guilt. We don't have snow here either (surprise!) but I did make it snow on my Christmas village. Check the blog for an upcoming post on that. Also, holiday baking gets me in the spirit. I have a few new recipes on my cooking blog you are welcome to check out!